Continuing our month of shows about anthologies, Alex Fitch talks to the creator and co-editor - David Lloyd - of a new weekly digital comics anthology, Aces Weekly. 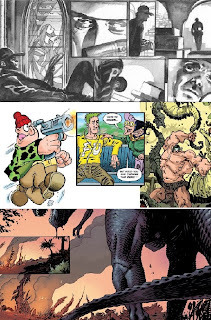 Alex also talks to three of the other contributors - David Leach, John McCrea and Kev Hopgood - about their new strips which will feature in the title and how the creators hope this will open up a new market for British comics in a brand new format. Last week's show about The Phoenix comic, featuring a panel discussion with Daniel Hartwell, Neill Cameron, Adam Murphy, Robin Etherington and Patrice Aggs is available now as a 'feature length' podcast. 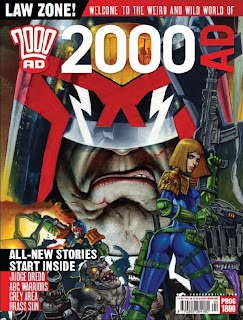 In an hour long programme to compliment this month's series of Panel Borders on comic book anthologies, Alex Fitch looks at "The Galaxy's Greatest Comic", 2000AD in its 35th anniversary year, alongside the release of a new Dredd movie, featuring the comic's longest running character. 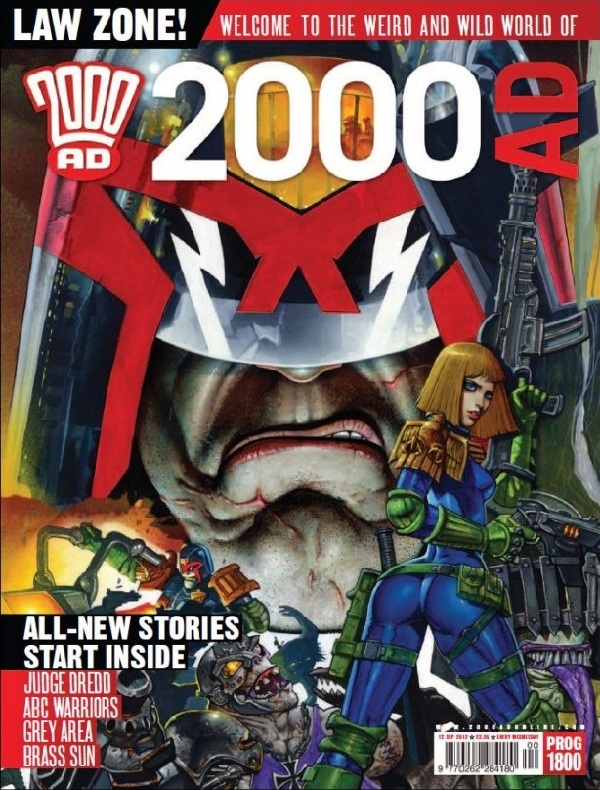 Alex discusses the recently released 1800th issue of the comic with editor Matt Smith; the process of writing Future Shocks with small press creator David Baillie; the drawing of memorable strips such as Harlem Heroes and Nemesis the Warlock with artists Kev Hopgood and Henry Flint; and the art of putting words in the mouth of indestructible lawman Judge Dredd with letterer Annie Parkhouse. 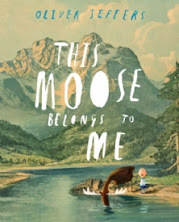 World famous picture book creator Oliver Jeffers will be travelling to the UK this Autumn to promote his beautiful new release This Moose Belongs to Me. During his brief trip he will visit London, Dublin, Bath and Oxford for events and signings. Oliver's picture books for children include the New York Times bestseller Stuck. The official World Book Day illustrator in 2007, How to Catch a Star debuted in 2004 to critical acclaim, and Lost and Found, published in 2005, won the Nestlé Smarties Book Prize Gold Medal 2006, the Blue Peter Book Award 2006 and was shortlisted for the Kate Greenaway Medal the same year. The Incredible Book Eating Boy (2007) won the Irish Book Awards Children’s Book of the Year. 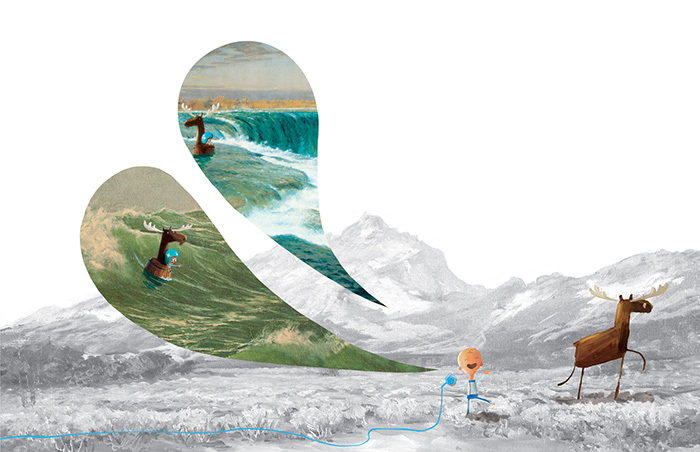 Jeffers’ style of illustration uses mixed medium and is recognised for its subtle narrative and use of space in composition. As a freelance illustrator he has worked for clients such as Orange UK, Lavazza, Sony PSP, RCA Records, The Guardian, Creative Review and The Telegraph. The Dundee Comics Day, organised by Dr Chris Murray at Dundee University, is now in its fifth year as part of the Dundee Literary Festival - although the current DCD name only came into effect in 2010 and there was a two day comics conference at the University under the rather unacademic name of Biff! Bam!! Crikey!!! in 2007, the year prior to the first Lit Fest. Last year the theme of the Dundee Comics Day was Wot I Learnt From Comics and attracted a bigger number of attendees than usual due perhaps to the change of date of the Lit Fest to term time and also due to the fact that virtually every speaker was an art- or script-droid for 2000AD. 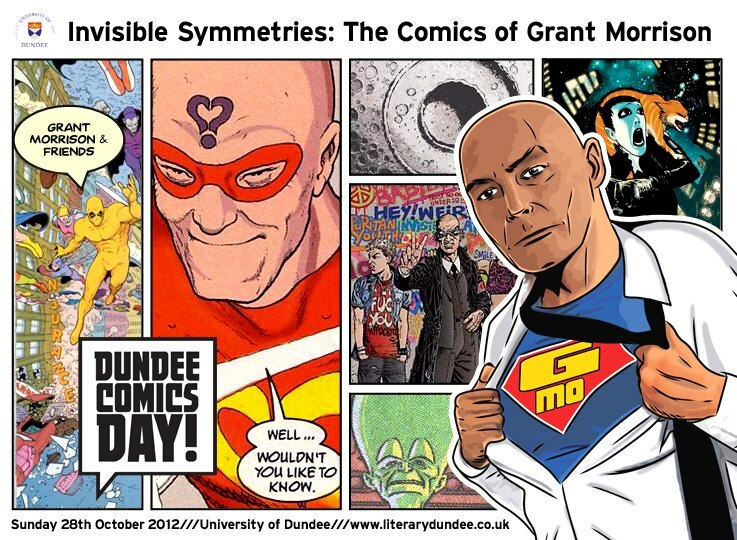 In 2012 the event takes this one step further and doesn't just concentrate its guests on one title but on one creator, writer Grant Morrison, with a day entitled Invisible Symmetries, The Comics Of Grant Morrison. 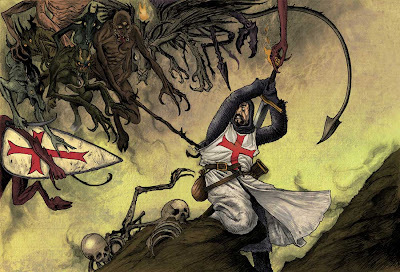 Grant received a MBE in the 2012 Birthday Honours list having worked on such British titles as Near Myths (below), Starblazer, Warrior, A1, Doctor Who Magazine, Trident, 2000AD, Revolver and Crisis (and has apparently even written some of those superhero-chappie stories that our colonial cousins are so obsessed by). Grant will be attending the Dundee Comics Day on Sunday 28 October along with his artistic collaborators Cameron Stewart (Batman), Frazer Irving (Batman), Frank Quitely (All Star Superman), Rian Hughes (Dare) and Jill Thompson (The Invisibles). Each creator will be giving a talk followed by a QandA session as well as signing autographs and taking part in a roundtable discussion. The day will conclude at 1800 with a wine reception and the announcement of the Dundee Comics Prize winners. The Dundee Comics Day takes place in the Tower Building of the University of Dundee beginning with registration at 1030 on Sunday 28 October 2012 and will run until after 1800. There are more details of the Dundee Comics Day at the Literary Dundee website were tickets, which cost £15 per adult and £7.50 per child, can also be purchased. A Comics Workshop will take place in the Tower Building of the University of Dundee from 1400 to 1600 on Saturday 27 October 2012 and the cost of the workshop is included in the Dundee Comics Day ticket price. There is a separately ticketed screening of the documentary Grant Morrison: Talking with Gods at the Dundee Contemporary Arts cinema and introduced by Dr Chris Murray beginning at 2045 on Friday 26 October 2012. Tickets for this screening cost £6.50 and are available from the DCA website. For those unfamiliar with Dundee, the Tower Building of the University of Dundee and the Dundee Contemporary Arts cinema are within a few minutes' walk of each other and are an approximately 10 minute walk from both Dundee's train station and bus station, and a five minute taxi ride from Dundee's airport. David Lloyd (V for Vendetta, Kickback) empowered the world with his iconoclastic Guy Fawkes mask in V for Vendetta. Today, comic conspirator Lloyd is changing the world with his publishing launch of an ambitious new online magazine called Aces Weekly. Acesweekly.co.uk is a sequential art magazine, available exclusively through on-line subscription which will be released as seven weekly issues which form a volume. Each issue will have at least three landscape pages from six contributors (18 pages per issue), plus many pages of extras such as artists sketches etc. Readers subscribe to volumes which cost £6.99/$9.99 per seven issue volume. Aces Weekly will be available exclusively on-line and feature all new material. Stored online, readers now have access to their magazine wherever they have web access. What makes Aces Weekly special? The creators have more control then ever before. "The aim was to create something very much like a traditional weekly English comic but without limiting the subject matter," says Lloyd explaining the origin of the magazine. "We asked a range of creators who we knew to be excellent - the reason for the ' aces ' of our name - to do whatever they liked within certain bounds of taste, and they just came up with a great mix of stories. “Most comic companies use creators to make money for the company, this company has been set up to make money for the creators," says Bambos Georgiou, the managing editor. 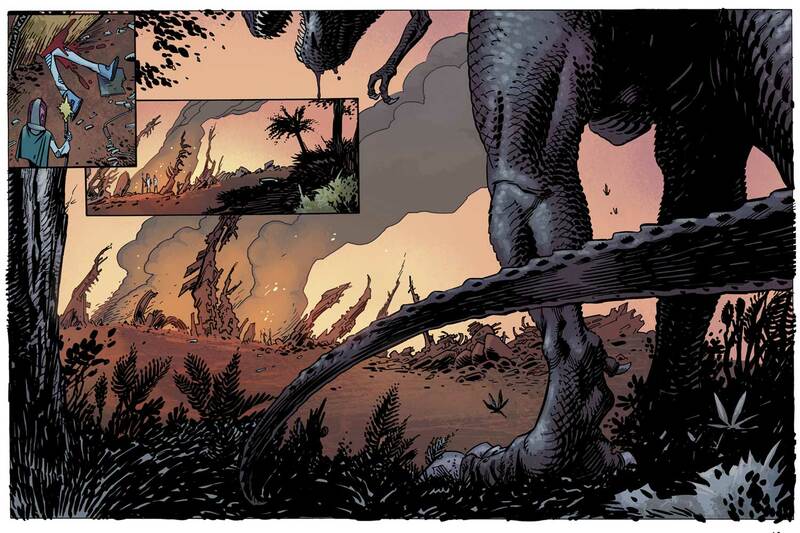 "This time readers will know their money is going direct to the creators." All strips are creator owned. Lloyd, who along with writer Dave Jackson has created Valley Of Shadows for Acesweekly.co.uk, has gathered together some of the top names in the comic industry to appear, such as Kyle Baker (Smash Mannix versus The Mob, the story of Detective "Hottie" McDaniel's quest to find out who's wiping out mobsters in unusual ways), Steve Bissette, Colleen Doran, Bill Sienkiewicz, Billy Tucci and Herb Trimpe, including, alongside him in the first volume; Phil Hester & John McCrea (Progenitor), JC Vaughn & Mark Wheatley (Return Of The Human) Alain Mauricet & Alexandre Tefenkgi (Shoot For The Moon) and David Hitchcock (Paradise Mechanism) who all contribute twenty-one page stories serialized over the first seven issue run. Also included in the first volume are stand alone three page strips by Lew Stringer (Combat Colin), Carl Critchlow (Thrud The Barbarian), David Leach (Psycho Gran), Esteban Hernández (Harmony), Phil Elliott (Gimbley) Rory Walker (Chloroform) and Mychailo Kazybrid & Bambos (Dr Queer). Contributors lined up also include Marc Hempel (The Love Brothers). The website goes live on 30th September 2012. 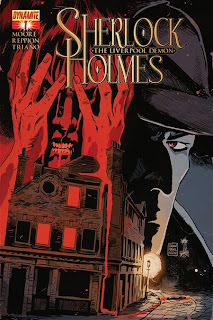 Leah Moore and John Reppion return to Sherlock Holmes after their acclaimed Sherlock Holmes: The Trial of Sherlock Holmes series for US publishers Dynamite. Sherlock Holmes: The Liverpool Demon features dynamic pencils from Matt Triano and a fantastic cover by the winner of the 2012 Eisner-Award for Best Cover Artist, Francesco Francavilla. “Sherlock Holmes: The Trial of Sherlock Holmes is one of Dynamite’s most acclaimed series,” adds Dynamite President Nick Barrucci. “It is a pleasure to have Leah and John back aboard for more mystery and intrigue." This is a book which seems to have slipped under the radar a bit. It’s an overview of girl’s comics written by Susan Brewer back in 2010, and published by Pen and Sword Books. Girls’ comics have traditionally been overlooked somewhat and not been given the same attention as boys’ comics. But there have been many classic girls comics, everything from Misty to Bunty, which are fondly remembered by their readers. This book looks like an informative and comprehensive overview and should be worth checking out by anyone with an interest in this area. On Friday the Cartoon Movement web site will be launching a new project titled 'Reinventing Peace for the 21st Century'. Working in partnership with the World Peace Foundation (part of Fletcher School of International Law and Diplomacy at Tufts University) the plan is to create a series of cartoons about peace in the 21st century, inspired by the visuals used by the international peace movement in the early 20th century. 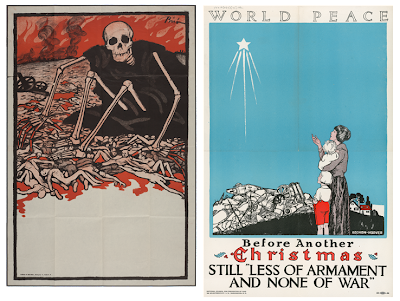 "One hundred years ago, the international peace movement believed that war between states could be definitively ended," notes the internet's Number One publishing platform for high quality political cartoons. 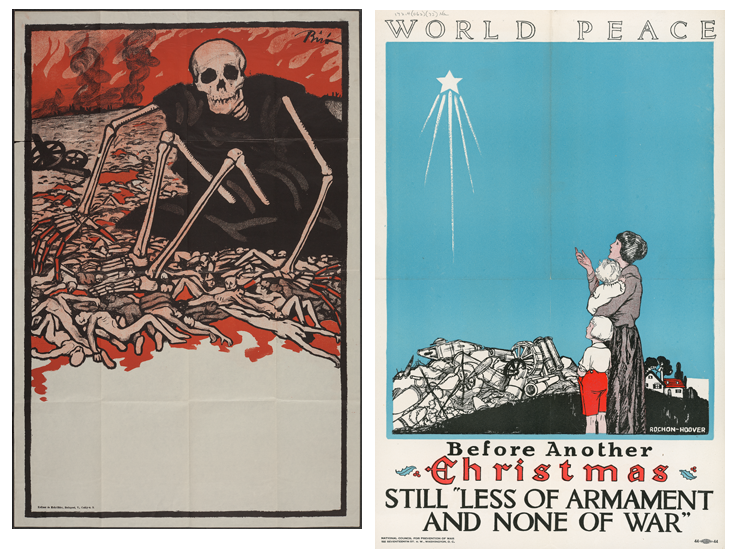 "Guided by this animating vision, advocates argued that the world needed to renounce war, to educate youth about the benefits of peace, to disarm, and to create new institutions for resolving disputes. "The outbreak of World War I in 1914 shattered such idealism. Post-war efforts to regain ground faltered in the crescendo of violence that was World War II. Nonetheless, in the postwar era, many of the instruments advocated by the peace movement were created, even if the vision for peace was dismissed as hopelessly naïve. "Today, we reap the benefits of the peace movement. Across the globe, not only are the instances of armed conflict fewer in our day than at any other point in history, but the conflicts also tend to be less lethal. "Yet, we do not live in a world at peace. War remains a reality for too many and too serious a threat to be dismissed. Further, the dominant patterns of conflict have changed: violence is more determined by non-state actors, globalized communications, commercial interests (licit or illicit), and sub-national disputes, proving remarkably intractable to the tools of conflict resolution. "To respond to today’s conflicts, we not only need new instruments and tools―we need a new vision of peace. "Our challenge is to reinvent peace for the next hundred years." On September 21st 2012, the International Day of Peace, the Cartoon Movement will launch a newsroom asking their cartoonists to translate the visuals that were used 100 years ago to the reality of the 21st century. The cartoons will be used in an exhibition at the World Peace Foundation. 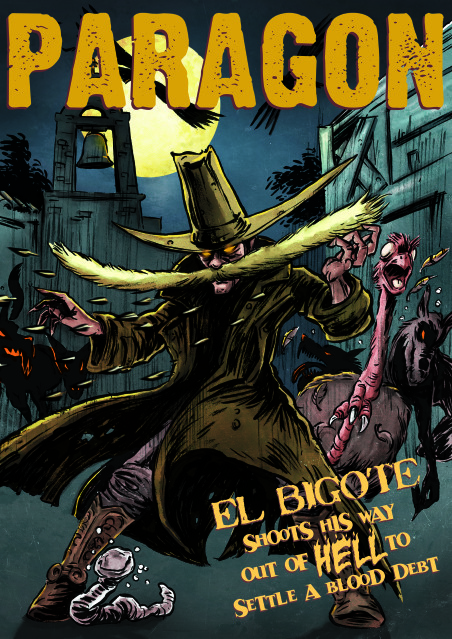 Behind this fantastic cover for the latest by edition of indie comic Paragon by El Chivo and Matt Soffe are 32 A4 pages of some the world's most wonderfully weird heroes! You’re South of the Border now, the border between Life and the Afterlife. 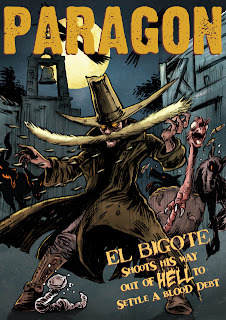 Welcome to Undead Mexico, where El Dia De Los Muertos never ends… Living dead banditos and ghoulish conquistadores, cannibalistic muertoads and spectral sessquatches prowl Mexico’s haunted prairies – and it’s up to Undead Mexican Mustache-Quillslinger El Bigote to put them back in their tequila worm-infested graves! There's alchemical athletics, competitive cantrips and transcendental track-and-field in this issue's 'Spencer Nero', as our pulp hero goes for gold at the Berlin Olympics! Can he keep his shorts on and foil a nefarious Nazi plot? In which the plucky World War Two Tommy finds himself in the desert looking for the secret of eternal life! Following his plunge into the murky depths after 'flying too close to the sun', reckless Greek teen Icarus is rescued from his watery grave by Meriope, an alien female who saves his life and bestows his damaged wings with magical properties. When she is subsequently captured and drawn aboard a submersed alien vessel, Icarus gives chase in an attempt to return the favour, soon finding himself millions of light years from home in an alien galaxy. Freeing Meriope from her captors, the Bonemen, Icarus learns she is an Artist with the ability - via a special brush and a substance called Mythica - to 're-draw' living beings in a form of her choosing, transforming them into Mythicals. Icarus unwittingly frees a number of these creations - also retrieved from Greece by the Bonemen - little realising he, himself, is now one of them. Confronting Dax, leader of the Bonemen, Meriope learns the reason she has been captured is not to stand trial for a past indiscretion, as she believed, but to save her universe from destruction. And Icarus is going to have to help her?! Special offer! Anyone who buys a paper copy via the paypal link gets their own cut-out-and-wear El Bigote facial hair! The digital STRIP #6 is now on sale for iPad on the iTunes store, comprising some strips from the print edition of STRIP #5 and some bonus digital only extras, for just £1.99. Mike Conroy – who is Print Media's point of contact in the UK - has also received the print edition of Issue 5, after a very long wait and several woefully incorrect updates from Print Media Bosnia's previous couriers. Earlier this year, unaware of the problems that would befoul its print magazine, Print Media decided to split the content of the giant-size STRIP #5 roughly in half in order to produce two special, experimental digital editions. STRIP Issue 6, published in partnership with ROK Comics, is the second of these, and includes some bonus items that include special promotional pages for a number of British comic creator-owned projects such as RollerGrrls by Gary Erskine. • In BLACK OPS EXTREME (by John Freeman and PJ Holden) the the do-or-die military team face off with a dangerous terrorist in the middle of an embassy siege! • Reluctant hero Constant finds himself betrayed in THE DEVIL'S HERITAGE (by Jerome Felix and Paul Gastine)! • Will an elven warrior find the help she needs in her quest in AGE OF HEROES (James Hudnall and John Ridgway)? All this plus interviews with comic creators Leo Hartas (artist and co-creator of the stunning "Mirabilis: Year of Wonders") and writer and publisher Jim Alexander (plus some pages from his comic, "Amongst the Stars", drawn by Mike Perkins); a taster for Tim Perkins glorious space fantasy story, "Worlds End"; and more crazy antics from BOGEY-MAN BOB. There are also special tasters of two comics from Print Media's digital partner, ROK Comics - Team M.OB.I.L.E. and Houdini. The previous digital issues of STRIP - for iPad only at present - are also available for just £1.99 each. The Comica Festival, in association with the South Asian Literature Festival, is to host an event with Indian artist Amruta Patil in London at the end of September. 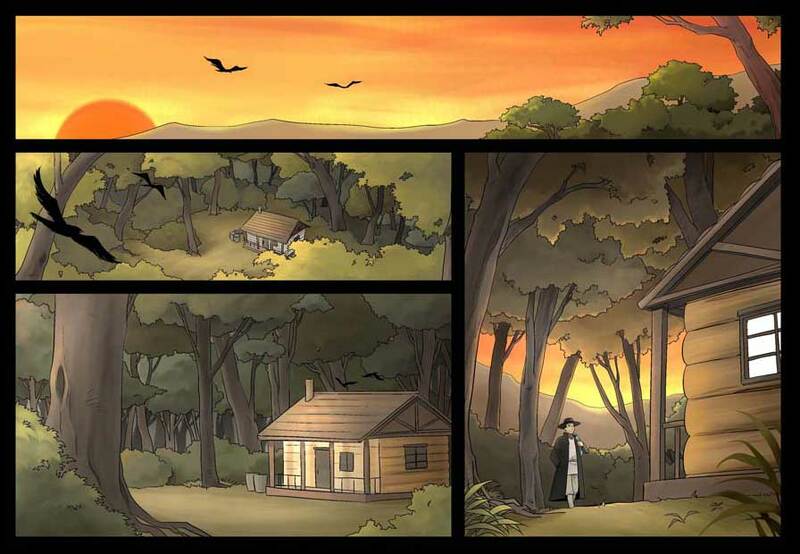 A writer and painter with an MFA from the School of the Museum of Fine Arts, Boston, Amruta has become India’s first female graphic novelist and an internationally acclaimed author and artist. On Friday September 28th, she will engage in a Comica Conversation with the award-winning novelist Neel Mukherjee at Foyles Bookshop on Charing Cross Road. 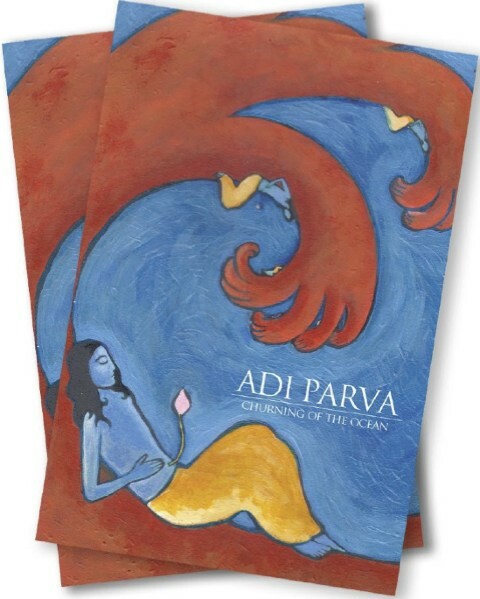 Amruta and Neel will also discuss her much-anticipated new graphic novel entitled Adi Parva: Churning of the Ocean. The first in a trilogy, this tells a tale drawn from the opening chapter of the Mahabharat, one of the greatest epics from India. With her evocative illustrations, Amruta relates this story through the recollections of some of the main characters. 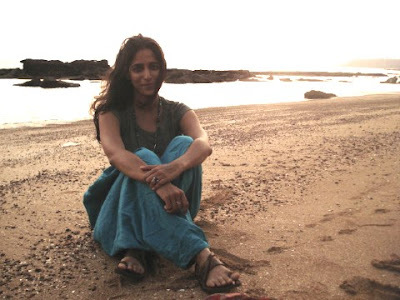 She has experimented with the story by choosing three relatively quiet protagonists, using them as ‘sutradhars’, or storytellers, for different parts of the tale, with a backdrop that sprawls across heaven and earth. The cast includes gods, demigods, queens, sages, seers, seductresses, hermits, kings, warriors, and navigators of the multiverse. Amruta will be speaking with Neel about the process of adapting the great Epic into graphic novel form, and what readers can expect as her trilogy unfolds. The conversation will be introduced and hosted by Paul Gravett, co-director of Comica Festival. 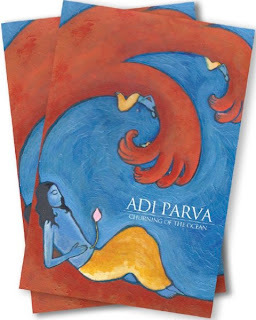 Following the conversation, Amruta will be signing copies of Kari and a limited supply of advance copies of Adi Parva (published in October by Harper Collins). Neel Mukherjee’s award-winning debut novel, A Life Apart was published in 2010. His second novel, The Lives of Others, is out in January 2014. He reviews fiction and graphic novels regularly for The Times and is also a contributing editor for Boston Review, where he starts a column from the beginning of next year. • You can read Neel Mukherjee’s complete review of Kari here, and read Paul Gravett’s profile of and interview with Amruta Patil here.